Jesus and the "Samaritan woman"
Psalm 89 v 10 You tame the anger of the sea. When streams rise up you calm them. Let us go from the other side of the lake (Sea of Galilee). Whilst the disciples were navigating the boat Jesus fell asleep. A big windstorm arose and waves came into the boat so much so that it was already filling up. Master, Master, we are going down! We are going to sink! Who is this then that both the sea and the wind obey? When Jesus heard the news of John the Baptist's execution, he took himself off to the mountain alone to pray and meditate. Night fell slowly on the hill, which overhangs the Lake of Gennesaret. One by one the lights were lit in each house illuminating the area around the lake like a myriad of stars in the sky. Now and again, on the beach, one could make out some torches, which were swaying to and fro carried by some figures, which seemed to be in a hurry home. Jesus was so deep in thought that he had not even realized that a storm had arisen. The moon had disappeared behind some big clouds and the wind had begun to whistle and to swirl around in gusts, the wind was against his disciples. Suddenly, the Master had the premonition that his disciples, whom he loved, needed him. He came quickly down the hill and as if the waters were of solid ground, he set off on foot on the raging sea in spite of the waves which were sometimes several metres high. But the Master was not worried. He seemed to be carried by the waters like a strong air cushion. The boat was tossed around like a cockleshell in a storm, which threatened to capsize it in spite of the fact that there were some sound experienced sailors on board; the disciples began to seriously worry! Some rowed furiously, others took it in turns to bail out the water from the waves which had collected in the bottom of the boat. Take heart, it is I!! Do not be afraid. If it is You, Lord, command me to come to you on the water. Man of little faith, why do you not trust me? Peter was ashamed and did not reply, they both got into the boat and as if by magic, the "wind dropped". The other disciples gathered around Jesus saying - "You are truly the Son of God". Alone, Peter sulked at the end of the boat and he swore that it was certainly "the last time that he would ask the Master to walk on water". · Thus the prophecy from Isaiah came through ch 35. Mark 6 v 55 The people of that whole region began to bring the sick on mats to wherever they heard he was. They put sick people in public places and they asked him to allow them to merely touch his clothing, and all of those who touched him were healed. Matthew 15 v 31 So that the crowd was amazed when they saw the mute speaking, the maimed whole, the lame walking, and the blind seeing. And they praised the God of Israel. Mark 7 v 36 Then Jesus ordered them to tell no one; but the more he ordered them, the more zealously they proclaimed it. Matthew 4 v 24 So his fame spread throughout all Syria, and they brought to him all the sick, those who were afflicted, with various diseases and pains, demoniacs, epileptics and paralytics, and he cured them. Usually the Jews and the Romans hated each other. It was even usual for Jews not to enter the house of a pagan and even less so that of a Roman leader of the occupying army. Otherwise, it was considered impure for several days. All of this the centurion knew but it seems that at Capernaum at least the Galilean Jews were more conciliatory than those of Jerusalem and that the local religious leaders and the non-religious leaders and Roman military got on well. Lord, I am not worthy for you to enter my home but only say the word and my servant shall be healed. Because, I, who am submissive to superiors, I have soldiers under my command, and when I say to one of them: go, he goes, when I say to my servant do that, he does it. His faith, trusting in the supernatural powers of the Nazarene. "I have not found a greater faith in Israel"! Several people would come from the East and from the West and would be seated at the table of the Kingdom of Heaven whereas the son of the Kingdom would be rejected into external darkness. Let it be done to you according to your faith (that is to say that your servant will be healed in the manner in which you have requested it) At that very moment, the servant was healed. An important lessson was thus given to those who believed themselves sole heirs of the kingdom. God rejected those whose acts did not conform to the spirit that God demands from his children. Simple pagans (of no official religious affinity) of upright character, who practised love of their neighbour, respecting the life and the religion of others, practising charity, would be allowed at Abraham's table in Heaven which promises us even more surprises! Immediately, his ears were opened, his tongue was released and he spoke plainly. It is an unforeseen event, which amazes one by its spontaneity. It is the visible intervention of the supernatural, which corrects a natural deficiency by the laws of exception. It is a gift from Heaven, a proof of the divine presence, which fulfils a wish to show to which point the Father's Heaven collaborates with his Son to show his glory and his power. In Jesus' time, it was a "message" which often came very timely (as if destiny had worked out everything in advance) in order to reveal the teaching of Jesus. John 11 v 41 So they took away the stone. And Jesus looked upward and said, "Father, I thank you for having heard me". Matthew 11 v 21 "Woe to you, Bethsaida! For if the deeds of power done in you had been done in Tyre and Sidon, they would have repented long ago in sackcloth and ashes. But I tell you on the day of Judgement it will be more tolerable for Tyre and Sidon than for you. And you Capernaum, Will you be exalted to heaven? No, you will be brought down to Hades, For if the deeds of power done in you had been done in Sodom, it would have remained until this day. But I tell you that on the day of judgement it will be more tolerable for the land of Sodom than for you. This was rather a sensational statement from Jesus who indulged more the bad people's perverse inhabitants of Sodom and condemned more severely "its narrow-minded citizens" of Capernaum, which certainly did not please them. Jesus was going home to Capernaum when a man called Jairus came to him, who was leader of the local synagogue. He threw himself at his feet and begged him to come into his house because he had a daughter of about 12 years who was dying. Jesus agreed to follow him. On the way towards the house of Jairus comes in the episode of the woman with the haemorrhages. Jesus was still in the process of talking with this woman when already the regular visitors of Jairus' house, rushed to warn the leader of the synagogue that it was too late: his daughter had just breathed her last. It was from then on futile to trouble the Master for a cause that the doctors considered closed and already lost. Do not fear anything, only believe and she will be saved. Near the house where the young dead girl was lying, there was a noisy crowd who were crying and were shouting loudly (as was customary). Why are you making so much noise/ Why are you crying? This girl is not dead: - she is asleep. All the visitors stopped shouting to make fun of him, laughing at him mockingly. But at the imploring request of the father they pulled back a bit further in order to see better what was going to happen. 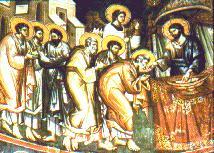 Jesus entered into the house with the parents and the three disciples chosen as witnesses by him - Peter, James and John. Talitha koumi, which means "young girl - get up!" and immediately the girl got up and began to walk. Everyone was afraid and surprised - in particular the professional mourners who left without insisting any longer. This miracle was talked about a lot in Capernaum (Jesus' town) but, in spite of these amazing things not many of the inhabitants believed in him. (Luke ch 7 v 11 à 17) Soon afterwards he went to a town called Nain, and his disciples and a large crowd went with him. As he approached the gate of the town, a man who had died was being carried out. He was his mother's only son, and she was a widow; and with her was a large crowd from the town. Luke explains that on this day they were burying the only son of a woman who was already a widow. It is told sometimes in the lives of people who suffer more intensely than others that misfortune and sorrow stick with them afterwards, like a shadow. This woman was crying, and she cried so much that everyone who was accompanying her could not hold back his or her tears of compassion. For example, when the body is old, used, sick and tired through age. Then, often after a long and difficult illness, death comes finally as a deliverance to put an end to situations without hope of healing, to moments where each minute, which goes by, seems like hell or the way of the Cross which does not end. There are also sudden deaths, which tear your soul and heart, such as those of parents who bury their children who are taken away by destiny or by mankind. God wants us to give everything for our children, who are like a part of ourselves and there is no more cruel a sorrow than stating that the life of such and such a person who means the world to you stops suddenly without any warning. Whatever the reasons behind the tragedy, accident, assault, suicide, sickness, death in combat or unexpected collapse of the body, the parents are placed before a fait accompli - the child which they created, fed and held in their arms no longer exists!" All of you who pass by - do you think there is any pain like mine? But at Nain, on this day - "the traveller Jesus stopped". The crowd that was following him no longer existed. He looked at this poor woman who was crying brokenheartedly and whom two people had difficulty holding up. She lost everything, which she had in this world. No husband, no son, she was now condemned to living on her own. Suddenly, the Master went up to the woman and said to her amidst all her tears and groans. Young man, I command you to get up. To everyone's amazement, the young man raised his chest and sat up in the coffin. There amongst all the whisperings- he began to talk. The mother almost passed out, she was crying again as before, but now, with joy! She was still as white as the coffin cloth and she tried to untie the bandages, which were wrapped around her beloved son's head. She kissed him and hugged him so strongly against her heart that the bearers could not get near him. - A great prophet is amongst us- God has visited his people. This story would cause quite a stir and the rumours of these miracles would spread as far as Jerusalem. Those people over there thanked him in their own way - by trying to stone him on two occasions. But in Nazareth, the adjacent village, people were at least beginning to rather consider this carpenter as a blasphemer, whom they had to throw at the foot of the mountain. Especially since his poor mother already did not have a good reputation, because she had brought a child into the world from an unknown father. That is why the Jews gave Jesus the name of "Son of Mary", and not of Joseph, as was customary. It is related that the gravedigger of Nain did not accept any payment for the expenses and the coffin. He simply found as an excuse to give the poor widow that it was not an official burial, and that he would find another "customer" for his coffin! When Jesus brought back three dead people to life, restoring them to their life, it was first of all to prove that death is not an irrevocable fatality and that Death itself obeys divine laws. Jesus wanted to create some precedents in order to demonstrate that his resurrection enters into the realm of the possible. Lazarus was dead and buried for four days; the son of the widow was dead for at least two days. Nothing therefore could prevent the Son to rebuild his temple (his body) after three days in the tomb. 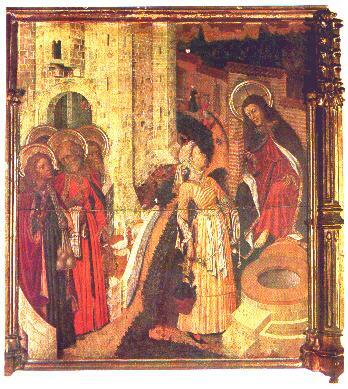 Peter (Cephas) and the two sons of Zebedee "James and John" - the only ones he authorized to be present at the resurrection of the daughter of Jairus. This supernatural demonstration would have delighted many scholars and scientists who sought desperately to travel in time and to elucidate the mysteries of life and the after life. Elijah, a prophet who lived mainly in the kingdom of Israel (that is, in Samaria) around about 850 BC. It goes without saying that one cannot admit a return to the past, (or a voyage in space and time), if one does not admit the principle of the resurrection (spiritual renaissance) and of life eternal. Furthermore since on was acquainted with the unbelievable distances which separate the galaxies, the stars and the planets, there was no other way than using the spirit to go quickly from one world to another. There are a lot of things we accept better once we understand them. Even if our message of faith has origins which date back to the mists of time and probably which escape our comprehension and material laws. One evening, Jesus went up a mountain, with his three favourite disciples. While Jesus prayed, the disciples sat down around a fire of wood and they saw that their Master was in a state of semi sleep. Suddenly, his face changed, he became like the sun and his white clothes shone like light. One can ask oneself why certain people compared for a long time the worship of the man combined with that of the sun? Master, it is good that we are here, let us put up three tents, one for you, one for Moses, one for Elijah? This is my beloved son in whom I am well pleased. Listen to him. Get up and they were relieved to see that he was alone! It is not from following "skilfully made fables" that we have made known the power and the Advent of our Lord Jesus Christ, but it is by having seen with our own eyes his majesty, when he received honour and glory from God the Father. This is my beloved Son. We heard this voice when we were with him on the Holy Mountain. Peter still under the charm of this white light shows us the way. You do well to pay attention to these prophetic words, thus you will be like a lamp which shines in the darkness, even to the morning when the Star of the morning will appear to illuminate your hearts. But what is that "resurrected from the dead"? For John, the important thing about the message is the new commandment which he ordered to his disciples: "LOVE ONE ANOTHER as I have loved you" as Jesus had loved them. Be that as it may, that night, four earthlings had during unforgettable hours "lived through and seen unbelievable possibilities " from the other world - the one of light and of people chosen by the Father to share a second life in the glory of the Kingdom of God. Samaria or the former country of Canaan, was a Palestinian province, locked between Galilee to the north, Jordan to the east, and Judea to the south. It was a mountainous country and very poor. In the time of Jesus it was populated by Jews and several foreign nationals who had come there as colonists. It was in 931AD, after the death of King Solomon, that the separation of the twelve tribes of Israel took place. Sachem in Samaria became the Capital of the ten tribes of the North and Jeroboam gave to this new State the name of the kingdom of Israel. Jerusalem remained the Capital of the two tribes of the South and Roboam gave these small regions the name of the kingdom of Judea. The kingdom of Israel was conquered by the Assyrians in 740AD and was taken over by Teglath Phalazar III, King of Assyria. This was a permanent take over. At the same time, the Assyrians occupied the country of Samaria with foreign colonists - certain pretty Assyrians of a more liberated spirit than the Jewish women marryied young Jews. That is why the Jews of Jerusalem quickly nicknamed the Samaritans as being of "mixed blood". When Cyrus liberated the Jews from Babylon, the Samaritans returning to the country constructed their "temple" on the Mount of Garza, to compete with the new temple of Jerusalem, which had been started by Zorobabel. For a long time the Samaritans were considered by the Jews as traitors, heretics and schismatic. The Samaritans only accepted the first five books of the Bible from Genesis to Deuteronomy and were rebuked for being often too ready to carry arms. Like the Jews from Judea, they were also waiting for a Messiah-liberator, a sort of new Moses, and even if the two nations claimed the same patriarchal roots, a true hatred existed between these two communities, because the Jews from the South despised them as much as they did pork! These relationships became more poisoned literally when in --175AD the Samaritans yielded to Antiochus IV Epiphane (from Syria) who had just had his brother thrown off the throne, invaded Palestine and replaced the temple of Yahweh with a sanctuary dedicated to Jupiter Xenios. In 128AD John Hyrcanus 1st (Son of Simon Maccabee), the prince governor of Palestine, left the fighting to his two sons, Antigonus and Aristobulus, who besieged Samaria and try to destroy the temple of Jupiter. Herod the Great finally did this during his reign. So it's an overheated climate which Jesus will meet when he goes to meet "mislaid ewes" while trying to make them share his universal message. "Who will prove me guilty of sin? If I say the truth don't you believe me? "Are we not correct in saying that you are a Samaritan? That you are possessed? "I am not demonised, but I honour my Father and you insult me." B. They sent messengers before him: and they went, and entered into a village of the Samaritans, to make ready for him. They did not receive him, and he decided to go to Jerusalem. "The son of God has not come here to lose souls, but to save them." Jesus, Master, have mercy on us. Were there not ten cleansed? but where are the nine? There are not found that returned to give glory to God, save this stranger. And he said unto him, Arise, go thy way: thy faith hath made thee whole. In this mountainous country, the jews had stopped up the natural water pools which had formed amid the rocks. They formed small reservoirs of clean water for men and cattle. This place had vecome a place of pilgrimage and now Jacob's well was there. Jesus therefore, being wearied with his journey, sat thus on the well: and it was about the sixth hour. "If thou knewest the gift of God, and who it is that saith to thee, Give me to drink; thou wouldest have asked of him, and he would have given thee living water". From whence then hast thou that living water? Are you greater than our father Jacob, which gave us the well, and drank thereof himself, and his children, and his cattle?
" Lord, give me this water, so that I am no longer thirsty and so that I no longer have need to come here to draw water." At this moment, Jesus saw that she had not understood the spiritual sense of the message that he wanted her to have, and then, far away in his own thoughts, he replied. Go find your husband and come here with him. But I do not have a husband. It is true, you are right to say that you do not have a husband, because you have had five husbands and the man with whom you are living is not your husband at all! "Lord, I see that you are truly a prophet"! Since she had already had this unexpected chance of being able to speak to a real prophet, she was going to take advantage of it in order to ask him the big question that had been worrying her since she was a child. "Our fathers have worshipped on this mountain and you (Jews) you say that it is at Jerusalem that it is necessary to pray?" Woman, believe me, the hour is coming when it will not be even on this mountain (at Sichem nor at Jerusalem) that you worship the Father. The Messiah may come from the Jews, but the hour is coming, (and it has already come), where the true worshippers worship the Father in spirit and in truth, because God is Spirit. It is in spirit that God asks to be worshipped. What a statement! Jesus in this moment confirmed that the spirit, the soul and prayer are superior to the two great stone temples where the Jews and the Samaritans prayed to the same God. He went as far as to reveal to her a prophet: at a date that he considered as near: "God will no more be worshipped at Sichem, nor at Jerusalem", but that the true worshippers of the Father would worship him in their heart and their spirit! I am He, to whom you are speaking. The disciples arrived, they were very surprised to see the Master speaking to an unknown woman and moreover, to a Samaritan woman. But none of them dared to ask him a question. Come quickly and see, I have found a man who told me all that I have done! Could this not be then the Messiah whom we are awaiting? It is no longer because of what you say that we believe, but it is because of what we have understood ourselves, we are also convinced that he is truly the Saviour of the world. There existed a custom by which every Jew could talk to other Jews under the portico of the temple of Jerusalem. John, Ch 7. Jesus was at Jerusalem, at the time of the festival of Tabernacles, and he was teaching the crowd of visitors under the portico of Solomon where he usually could be found. "No one has ever spoken like this man!" Our law does it condemn a man without being able to understand what he has done? Are you also from Galilee? Examine the law and you will see that no prophet comes out of Galilee? 3. Second murder attempt of Jesus. Where will he go? Will he kill himself? Since he says 'you cannot come where I go'? Your father is the devil and naturally you accomplish your desires of your father; the devil is a liar and he is the father of lies. Abraham rejoiced that he would see my day, he saw it and was glad. You are not fifty years old and you have seen Abraham? I say to you in truth, before Abraham was, I existed. They picked up some stones to throw at him, but Jesus hid himself and went out of the temple. "I have told you already, and you do not believe me. The works that I do in my Father's name testify to me. The Father and I are one." I have shown you many good works- for which you are going to stone me? It is not for a good work that we are going to stone you, but for blasphemy. If I am not doing the works of the Father, then do not believe me. But if I do them, even though you do not believe me, believe the works, so that you may know and understand that the Father is in me and I am in the Father. Then they started to throw stones at him, not even noticing that not one of the stones touched him. Jesus escaped from their hands and sought refuge on the other side of the Jordan, at the place where John had first baptised (at Enon) - a land that was free from the authority of the Jews at Jerusalem. He stayed there for six days before the last Easter where, coming out of his hiding place, he decided to go to Bethany to perform his miracle of raising Lazarus from the dead. The following morning he made his entry towards the temple in Jerusalem, accompanied by a large crowds, who cried "Hosanna, son of David!!". "Beware of the yeast of the Pharisees and the Sadducees." Is it because we have not brought bread? Are you without intelligence? Men of little faith, why do you think it is because you have not bread? Do you not understand that it is not of bread that I am talking to you about? Then they finally understood that it was not a question of yeast for the bread, but of the "teaching" of the Pharisees and the Sadducees. Another day when Jesus was talking to the crowd, he shouted at the scribes and the Pharisees who still wanted to take his life. "Misfortune to you hypocritical scribes and Pharisees! You appear to say long prayers . You have taken away the key of knowledge and you have forbidden those who wanted to enter the doors of science from doing so. You strain out a gnat and you swallow a camel. You clean the outside of the cup but inside they are full of greed and self-indulgence. You tie up heavy burdens hard to bear and lay them on the shoulders of others, but you yourselves are unwilling to lift a finger to move them. You are blind guides and you lock people out of the Kingdom of Heaven. You devour the houses of widows. You cross sea and land in order to make a single convert and you make them children of hell as yourselves. You resemble whitewashed tombs, which on he outside look beautiful, but inside they are full of the bones of the dead and of all kinds of filth." If we had lived in the days of our ancestors, we would not have taken part with them in shedding the blood of the prophets. Thus you testify against yourselves that you are the descendants of those who murdered the prophets. Do what they ask you, but do not do as they do. They do everything to be seen and considered by men. They love having first place and being called rabbi. Only one is your Master (God) and you are all students." When Jesus said then " Love your enemies", the words make one think because it is not a question of loving violent, deceitful, bad people to the extreme who are fiends, but opponents of war who are in need and misery and who are brought, in spite of themselves into conflicts which they have not asked for! In order to illustrate his thoughts, Christ often used picture stories called " PARABLES". It was the simplest way and the least provoking way to say truths and to make illiterate people understand or people who they applied to without them feeling personally offended. A man planted a vineyard and developed it. As he had to leave he leased it to tenants. The harvest time had arrived and he sent some slaves to collect his produce. Kill him, and let us get his inheritance. What will the owner do to the tenants, when he comes? He will make these despicable people perish and lease the vineyard to other tenants who will give him the produce at the harvest. A/ Matthew 22 v2 It is the story of a king who gives a wedding banquet for his son. Alas each guest refused to come at the last moment; they even seized his slaves and killed the royal messengers. The king became angry and punished the unworthy people who were invited. Then he sent his messengers to replace them with strangers. B / Luke 14 v 15 His parable has a similar meaning to that of Matthew above, except that Luke insisted even more on the fact that the replaced people are unfortunate poor people. "A poor woman gave one of her last small coins to the temple, keeping herself hidden. During this time the pharisisees and rich sadducees threw large amounts of their money flamboyantly into the offering basket. " Jesus considered that this poor woman gave more than all the other donors together. "Those wealthy men already had their reward while giving before everybody of their riches, but this poor widow gave the money she needed to live."